Born in Germany, I work as an independent sculptor since 1975. From 1964-1966 I was a student of sculptor Albert Wider and was introduced to sculpting through helping with bigger commissions. From 1966-1969 I was a student and assistant of Prof. Karl Baur, Munich (big size work in wood). From 1969-1972 I studied at the Art Academy Brera, Mailand, Italy with Prof. Marino Marini and Prof. Francesco Messina and from 1972-1975 with Prof. Wilhelm Uhlig at the Art Academy, Nuremberg. There have been numerous group and solo exhibitions in among others Germany, France, Switzerland, Iraq, Italy and England. Memberships: member and board member of B.B.K. Middle Franconia, ANK-Nuremberg, Artist Society Schwabach and German Society for Christian Art. My style is predominantly figurative. My work is based on the language and secrets of nature, architecture and its manifestations in art. Clearly defined three-dimensional objects come into being, appropriate to their location, founded on durable solutions. Even after many encounters they still surprise and give joy to the viewer. Human figures, portraits, animals, fountains, funeral monuments, crosses, reliefs, portals, objects, architectural monuments. Wood, stone, ceramics, cast, polystyrene, wax, gronze, tombac, steel, concrete. Making visible what in nature is hidden, covered and veiled, so that the realised object speaks clearly yet without words. I search for a representation that convinces, viewed from all sides. Everything around us is one huge integrated miracle, full of infinite wisdom and dimensions. The sculptures are fresh, cristal clear, lively, authentic, without sentimental pathos and sweetness. 1. 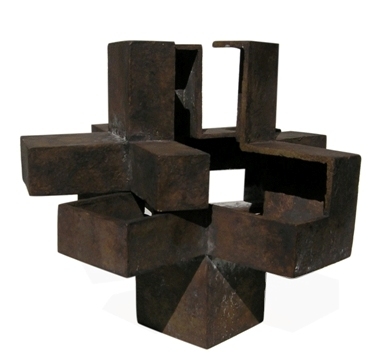 Hommage à Chillida, bronze, 24 cm x 26 cm x 27 cm. A cross that is broken open. Internal and exterior forms. 2. 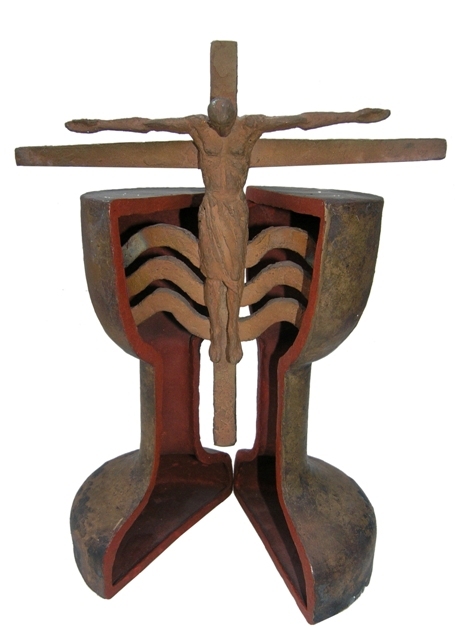 Christ in Ecumenism, bronze, 28,5 cm x 18,5 cm x 13,5 cm. Two broken chalices hold and carry the dying and resurrecting Christ. In both parts is space – content and emptiness, shelter and vulnerability. Where is unity? Where truth? The goblets (they could also be human breasts) painted blood red. 3. 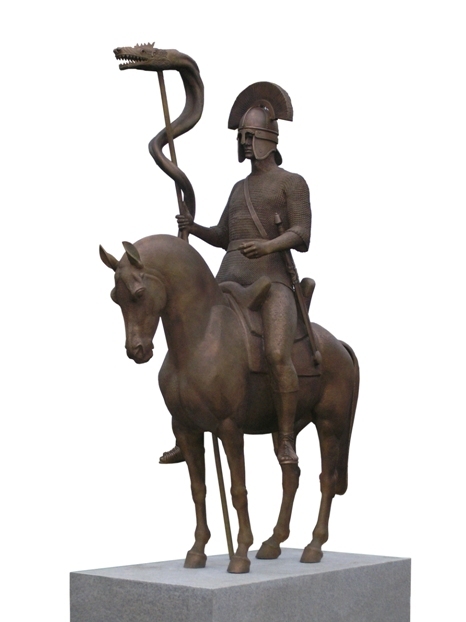 Saint George, bronze, height 290 cm. 4. Camel, bronze, height 16 cm x 34 cm x 12 cm. One of many animal sculptures.